Whenever folks talk about the Hour of Power with Bobby Schuller and Shepherd’s Grove Church, one of the first things that comes to mind is our amazing music, and our sensational choir. It’s no secret that we are blessed to have the “best choir in the world,” as Bobby says so often from the pulpit. 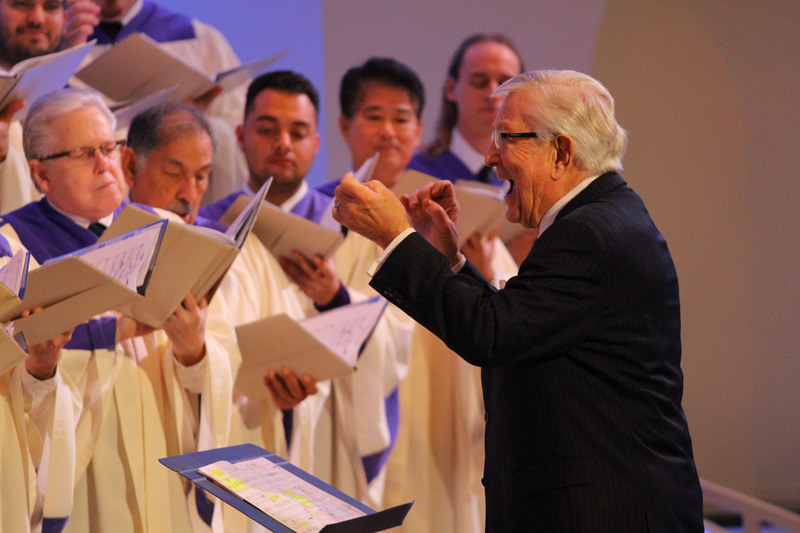 At the center of that excellence is conductor extraordinaire Don Neuen, who has been faithfully serving our congregation with his immense talent and knowledge for several decades. Don is known worldwide as one of the best performance leaders in the world, and one of the foremost scholars and experts on the works of Handel. His textbooks and scholarly work is widely used, and have been translated and shared around the world. He is also the recipient of numerous accolades, including the highest honor given to citizens from his home state of Indiana. We are thrilled for Don to begin his next chapter, and are overjoyed to send him with best wishes as we celebrate his work and time with us. 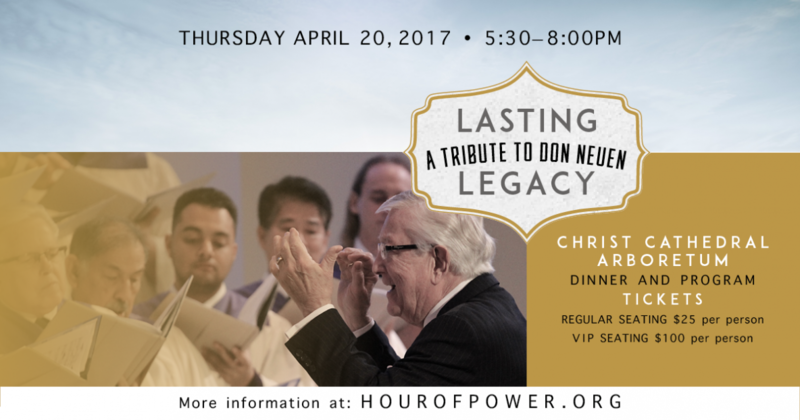 On April 20, 2017 at 5:30pm we will be hosting our special event, “Lasting Legacy: A Tribute to Don Neuen,” to be held in the Arboretum at Christ Cathedral. This occasion will include dinner with Don and friends, shared reflections and memories from his time with us, and sensational performances from longtime favorites like Tom Tipton, Dorothy Benham, and Daniel Rodriguez. Of course, Don’s beloved choir will be there as well, showcasing the love and skill he has added over the years. Tickets are available for purchase starting Sunday, March 12, in the plaza at Shepherd’s Grove, or by calling us at 714-971-4000. Cost will be $25, with a limited number of VIP tickets available for $100. This is an exclusive event, and tickets WILL sell out! We wish nothing but the best to Don and his wife in their newest adventure, and invite you to join us in showing our love and admiration. God loves you, Don, and so do we! Don will be leading the Hour of Power Choir for a special performance of Handel’s Messiah at Shepherd’s Grove on Friday, April 14 at 7:30 pm. This free event is open to all! learn more here.